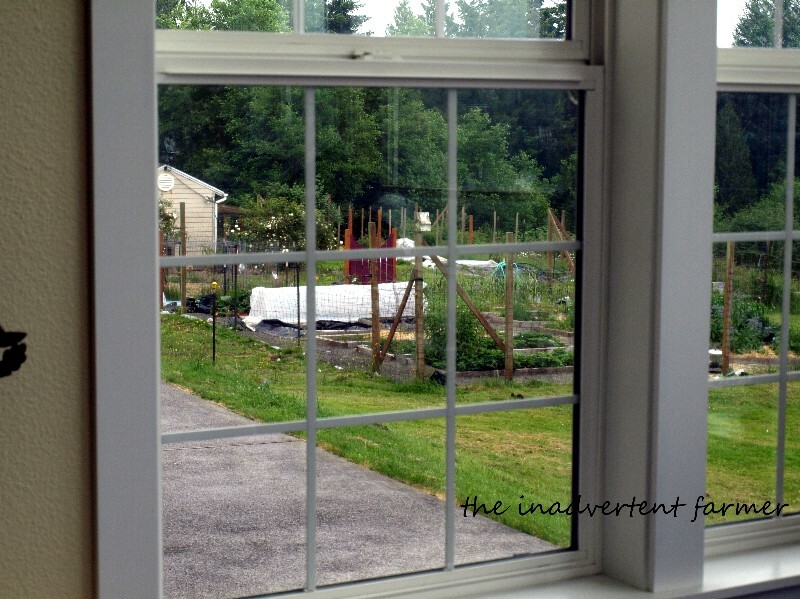 « Sunday Photos….How Does Your Garden Grow? It is not my personality to makes lists…even when I do I lose them so I figure what is the point? But for this for an undertaking this big I made a list of rooms that needed de-cluttering, what I hoped to accomplish in each area, and what supplies I needed. I though about starting in the hardest most messy room in the house…my craft room. But figured I would be so exhausted by the time I was done that I would not have enough gumption to tackle anything else for months. So instead I chose a room that is rather public, that the kids seldom mess up in, and something that would please my organized-neat-orderly-hubby. 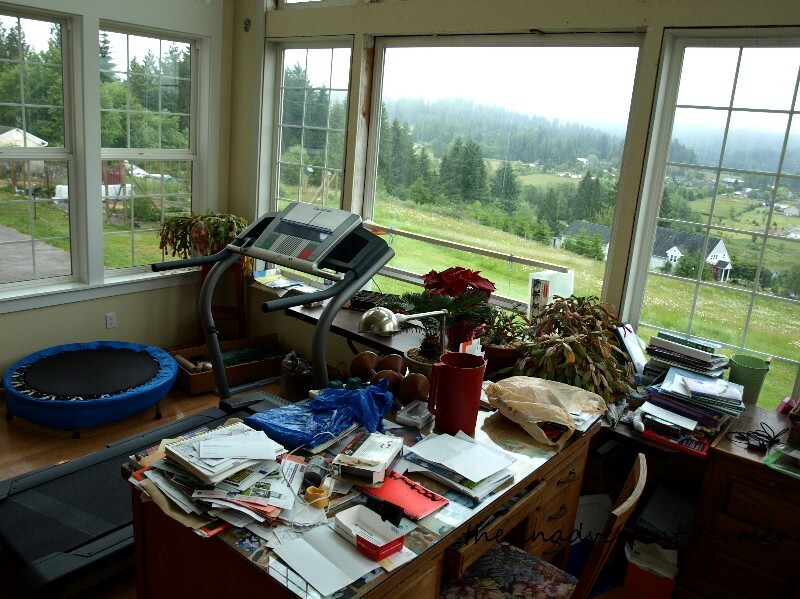 Our office/sunroom/exercise room is mostly being taken over by paperwork…something that seems to be a universal problem in most homes. 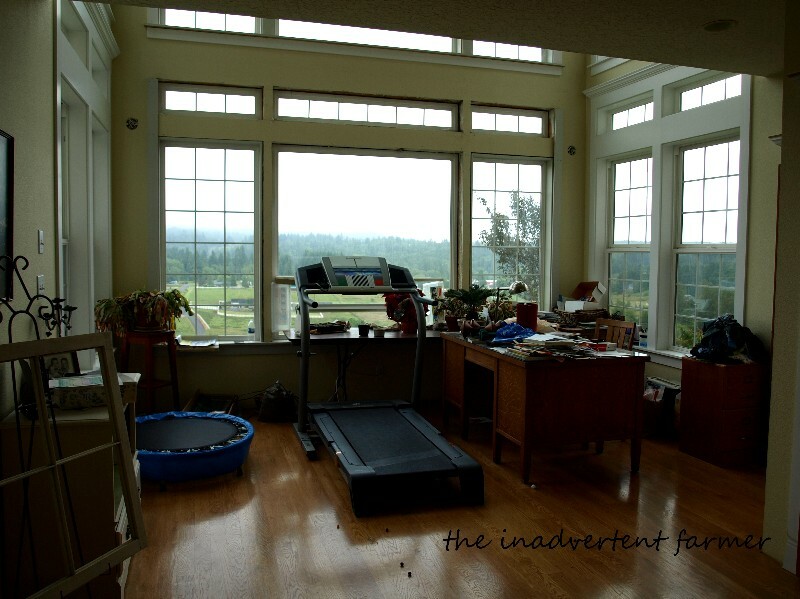 It is a room that once cleaned and organized would most likely would stay that way for the foreseeable future because I only use it to run on the treadmill and the kids only use it to jump on the trampoline. Well except in the late winter/early spring when the big table under the window is covered with seedlings…but for now it is just collecting more clutter. I’m giving myself till next week to do this because chances are that if the weather is nice I’ll be out there..
Next week I’ll share the after photos and the strategies I came up with for organizing the paperwork monster. If you guys have any great tips for keeping paperwork under control I would love to hear them! I do it in chunks of time. I set the time for 10-15 mins. then reward myself with a cup of coffee on the patio or something like that. That way I tend not to get distracted and have a better chance of staying focused. Good luck!! Now I feel like I need to clean off my desk, too! I have no great tips; looking forward to others who do, because I need them too! But…I LOVE the windows and the room and the view you have! What a great room! Not that my paperwork piles are managable, but I scan everything I can into pdfs and shred the originals. Now if I could just “organize” all those pdfs so I can find what I’m looking for when needed. Good luck. I’m certain you’ll have it all in order by week’s end. I love the idea of scanning things to PDFs, but I’m not sure that would take care of my immediate problem (the things I’m thinking about/doing something with right now). I finally set up a little hanging file bin at my desk, out in the open, and it seems to give me a good place to put the odd things I collect on different topics, before I’m ready to file them “away” for real. Good luck; it’s a beautiful room! I can’t wait to come back to see the change. I too need to know how to over come the paperwork monster! My paperwork has outgrown my file space. I like the idea of scanning some of the older material to PDF. Does the IRS accept a PDF as “the real thing”? I’m a freelance writer and as such have mountains of contracts, correspondance and receipts that the IRS will probably never want to see–but I’ll be screwed if they do and I can’t find ’em. I wouldn’t even have noticed a bit of clutter in that room, I am way too distracted by those awesome windows & view! In response to the question about PDF recordkeeping, according to IRS Revenue Procedure 97-22 and IRS Publication 522: Recordkeeping for Individuals, most records CAN be in PDF format. The caveat here is the records must be true scanned copies of the originals, (e.g., you can’t just type income or similar numbers into a spreadsheet in Excel or something and submit that to the IRS) easily reproduced (e.g., you must be able to create multiple copies, if necessary), and also backed up in some form (e.g., via another electronic source, external hard drive, paper files sent to storage, etc.) Otherwise, PDF is a great way to maintain files. Check out the IRS website for more info on the Revenue Procedure and Publication. I’m with Aubrey – what clutter! I guess there are two reasons I don’t see the clutter. 1- the view from your windows. 2. my clutter and piles are higher and more pronounced. BUT I know exactly where everything is! Like Brandi, I do things a little at a time, trying for basic upkeep (very basic!) on a daily basis so as not to have things get to the overwhelming stage. It seems much easier to do some tidying that way, and plus doing it each morning for just 10 minutes makes it part of the morning routine, just like getting dressed or preparing lunches. I’ve also taken to putting things on PDF when I can – it’s easier to find for me, and takes up less space when the documents just go on a flash drive organized per topic with a different drive for different categories/subjects of “stuff”. that is a stunning room, love those windows! I have clips on the inside of my kitchen cupboards for bills, kinder, scouts, each school boy has a clip, catalogs ect, then when each thing is actioned it goes onto the “to file clip”, then when I have the urge, it gets filed away into lever arch folders. I keep lever arch folders in the kitchen and file everything in there.